Under the cover of darkness, while all slept, the aliens came. They made a sound like the gentle rush of a stream as they poured down upon the land and sought out spots for perfect landings. Some of the people stirred to hear such unusual noise outside their windows, but there was no suddenness or threat to the sounds, and so most everyone smiled sleepily with the pleasure of being so cozy, and snuggled deeper under the covers to dream away the rest of the night. And in the morning that dawned crystal clear and bright, the children and adults were dazzled by the aliens that had perched on common things, everyday things and overlooked things. The aliens had not chosen for their landing spots, the most impressive structures, ones that might make suitable thrones for their moment of discovery. Instead, the aliens had chosen simple places to call home. And with their resting in simplicity, they dazzled and bejeweled each spot, transforming it with peaceful wonder. Fresh from sleep, the people let their eyes dance from one sparkling vision to the next. They leaned in close to exclaim at the beauty that transformed their ordinary landscape into mysterious and striking new vistas. 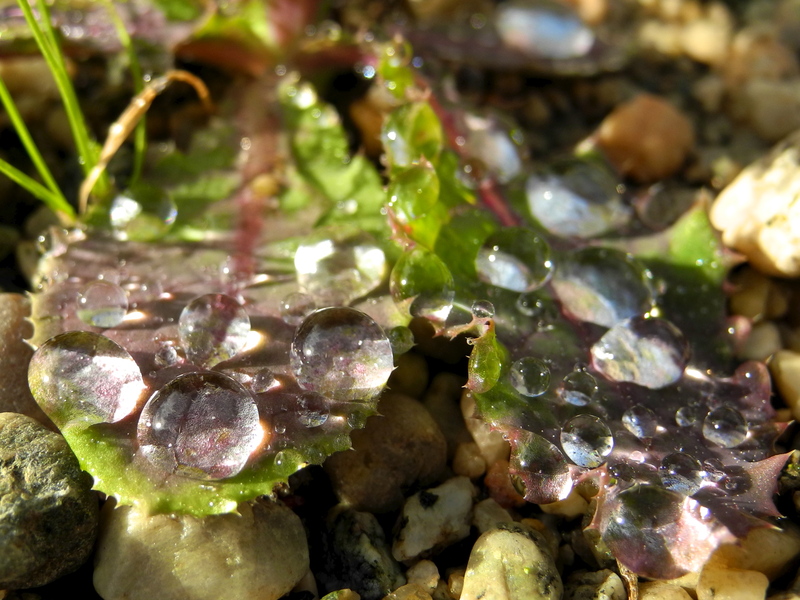 Each leaf held jewels that captured and reflected the glory of the morning. The rain had come to the drought filled land. The people had not seen rain, nor heard it in their sleep for many months. But when the sound of the alien storm raised its voice in the night, their dreams remembered the sound of rain, and that is why they did not awaken until the sun came up. And lo, what gifts alien rains did bring. Stay wet out there! Greetings to all from a little less dry Southern California girl. what a great shot – love the “alien” edge! Thank you ntexas! I thought that point of view was a bit fun! I so love your writing style, the way I love reading Hemingway! Oh my dear David, I am so humbled..and honored. I’m smiling now!